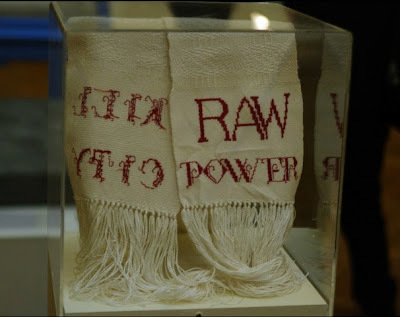 Here's a shot of the Asemic Kill City/Raw Power scarf in its habitus at the Text Festival in Bury, England, in the art gallery's accompanying exhibit. Thanks to Nico Vassilakis for sending me the photo. And here, Ron Silliman tweets about it! The background of his Twitter account looks like a repeating pattern of artwork by the great collagist Jess, Robert Duncan's life partner: ornate, rococo and postmodernly lush. It's an honor to have the scarf displayed at this Festival, where a host of luminaries, including Ron himself, Christian Bök, and later on, Adeena Karasick, my collaborator, are reading their work. In response to my query, James Williamson has expressed a preference for a short fringe in accordance with men's fashion protocol, and to keep it secular (I told him the long fringe might make people mistake him for a rabbi). I will donate (!) the leftover thrums to the Minnesota Center for Book Arts for their papermaking mavens. Yes, I love this post. I love to buy skirts online. thanks for sharing. I love scarf also.